ZDoom • View topic - [WIP] 2K UltraHD Texture Pack for Doom in the works. [WIP] 2K UltraHD Texture Pack for Doom in the works. Re: [WIP] 2K UltraHD Texture Pack for Doom in the works. So you've created these truly amazing textures. And GZDoom recently added support for PBR and materials. This looks like a great opportunity to really show off how amazing your textures are. Your main texture package is several hundred textures, so I started with your Doom 1 override package. I optimized your PNG files, and then compressed them in DDS format (with pre-generated mipmaps). This should actually help performance as the DDS file can be loaded directly into your GPU without having to convert it, and mipmaps are pre-generated. Then I created normal maps for all of your textures. This I did in batch with a tool. I manually created bright maps and specular maps by hand for the 71 or so textures in this package. Then I created a definition file that tells GZDoom to use these textures. I've never created a Doom map before in my life. I'm going to just test this in existing Doom 1 maps and see if I can see any of these 71 textures in use, but someone could perhaps make a test map to showcase these specific textures. If these are working as intended and look good, I may do all the other hundreds of textures as well. The amazing thing is that your PK3 package was 280 MB to start. I added bright maps, normal maps and specular maps. It is more than 3 times the number of previous textures. But the new PK3 file is actually smaller at 256 MB. I have uploaded a 1k version to ModDB for those with lower specs and those that get stuttering in GZDoom with the 2k version. As a bonus, there are a handful of extra textures that will be in the upcoming 3rd demo of the 2k texture pack. Enjoy. Making 2k Texture Pack for Doom. I am living in a new house and the internet speeds are terrible. Especially the upload speed. Apparently, we will get a better fiber-optic setup in the next 3 months but at the moment I can't upload as the upload speed is less than 1Mbps (my internet is strictly wireless atm). If I make more textures I can't upload the 3rd demo until I get a reasonable upload speed. Please don't be disheartened by lack of updates, it takes forever to upload a single picture of new textures. I am really sad that I have not been able to work on my texture pack for so long due to complex health issues. I feel like I am letting my followers down as this is the longest break I have had because my health has declined and I am in and out of the hospital. I swear I haven't abandoned my pack and wish to get back to it as soon as humanly possible. I have made a new texture today. I spread the work over 2 days as I am not 100% better yet. 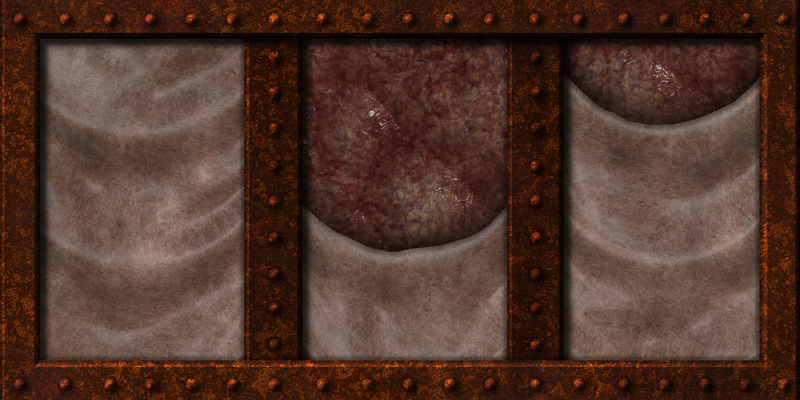 Here is a skin and flesh texture (4096x2048). Note: This is the first time I attempted skin. https://images-wixmp-ed30a86b8c4ca88777 ... 909baa.png (CTRL + Left-Click to view in another tab). I have gone as far as I can using PK3 files for my UltraHD Texture Pack in GZdoom. After making some more textures and adding them to the PK3 file it has become too big for GZDoom to like and the file now gets skipped and the main textures file no longer loads any of its textures. I have extracted the main PK3 file to a folder called TEXTURES and the textures are loading again. On older builds of GZDoom, the floor and ceiling textures didn't load when the textures were in a folder but this is not the case with the latest GZDoom build. As a bonus, I have noticed a huge improvement in performance now. I don't get random freezes during gameplay or when hitting switches. I set up another thread asking the GZDoom dev team to inform me what to name the 4 subfolders inside the textures folder so I can get the game specific override textures out of the PK3 files and into the TEXTURES folder. This way when the 3rd demo comes out not only will people get a marked performance increase but the mod will be easier to install. Instead of faffing around with batch files or struggling to get the files working in ZDL, it will just be a case of extract the TEXTURES folder into GZDoom and profit. Your textures are great! Keep up doing your work untill all the textures are done. That would be really great. I would also like to ask you: are you going to remaster all the textures in the game (including monster, weapon, and object sprites), or just the environment textures? I really wish to help your project, so I have tested some of your tesxtures on my machine. I have spotted a couple of issues and I will report them to you so that you could improve the quality of your work. As of now, I see three problems occuring to some textures. 1. Some textures are too repetitive and grainy. That could be a result of them using too small pattern alongside with bigger patterns, which catches the eye. For example one image of brick texture contains too many small bricks in it instead of less but larger bricks. I think you did not preserve the proportions of the elements in the textures when making them in high resolution. As result, detailed, grainy walls look odd next to walls will much bigger repetitive elements. 2. Some textures does not use smooth transition into themselves, therefore, the upper and lower edges of each pattern are vidible on the surface using the texture. I think textures should make a loop when converging, that is, the end of right side is the same as the start od the left side. 3. Using textures of that size makes the game laggy when first loading of the textures. For example, when opening the door to a room with new textures, the door may "stuck" on the screen for some time before the inside part of the room is vidible. This dissappears, however, after the first entrance to that room. I think even on the modern upgraded machines there's no need for UltraHD texture resolution, and 1024x1024 size should fit perfectly for that purpose. Maybe you could release sifferent versions of your pack for those who struggle with game performance with high resolution textures. Thanks for your attention, and I wish you good luck from now on with your work! Thanks for the kind words and for offering you help for me to improve my work. I am taking time off again for 3 reasons. 1: I had a major depressive episode and am staying with my parents until I can get into a private clinic for treatment. 2: I have the flu and am physically sick and 3: I had an accident last night and almost broke my wrist so my left arm is braced up. When I am in the clinic I will take my dads laptop in with me and will try to work on textures as therapy. I will keep you posted. Thank you. Hopefully you will feel better soon! Depressive illness, the flu and an accident? When you do things, you really do them! I hope your road to recovery is a short one. It sounds like you have support and are prepared to take the necessary steps to a better tomorrow. Good luck with that and if doing your textures helps, crack on. If not, then that's not where your priorities need to lie. Stay strong - and stop collecting medical issues like they're going out of fashion dammit! Thanks for the kind words and support guys, but health-wise, yesterday afternoon, things went from bad to the worst they have ever been. I had a mild heart attack yesterday and spend that day and most of the night in the ER on so many medications & I am still doped up from all the painkillers they gave me yesterday afternoon-yesterday afternoon. I am really concerned about my health more than ever now and am fearing I'll lose my life before being able to finish my texture pack. I have a family history of heart problems. My dad is on a truckload of meds and his dad didn't take pills and died of a heart attack at the age of 60 when I was a toddler.